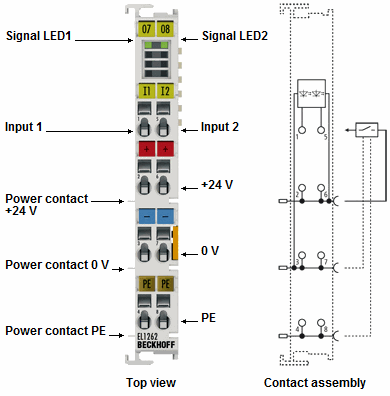 The EL1262 digital input terminal acquires the fast binary control signals from the process level and transmits them, in an electrically isolated form, to the controller. The signals are oversampled with an adjustable, integer multiple (oversampling factor: n) of the bus cycle time (n microcycles per bus cycle). For each microcycle, the EtherCAT Terminal generates a process data block that is transferred collectively during the next bus cycle. The time base of the terminal can be synchronised precisely with other EtherCAT devices via distributed clocks. This procedure enables the temporal resolution of the digital input signals to be increased to n times the bus cycle time.